It is a well know idea that we can learn a great deal about life and what is really important in life from our elders. In connection with this thought, I am sharing a website with the name of "Wise Archives", which in fact represents that ideology. The UK site is located in Scotland and has been designed to keep a digital archived record of personal stories, ideas, values and philosophies of those working individuals of the 20th century. We are not so unlike our ancestors. We have challenges, successes, hopes and dreams that are common to the human race. We all want to be happy and enjoy life. This site allows for you to record your thoughts about various subjects and they will be kept in an accessible archive for others to read only. The site does not allow others to download the stories. "WISEArchive wishes to recognize, value and preserve ideas, philosophies and concepts from people who worked in the 20th Century. Everyone has a story to tell and these can be stored in an secure online archive and be made available to view for other interested parties. WISEArchive follows all relevant legislation. For more information please contact us. 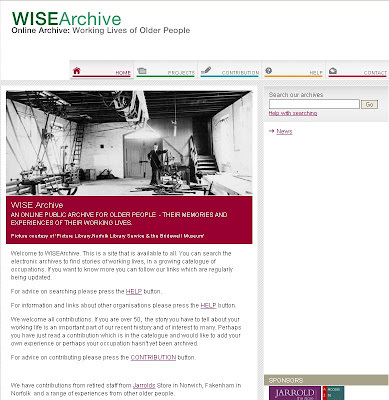 This site is an archive of recollections gathered by WISEArchive. The stories in the archive were contributed by members of the public and the views expressed are theirs and copyright remains with them. These stories contain the views of the public, not WISEArchive. The Archive represents the contributors' interpretation of events during their working lives and has not been fact checked or verified by any third party. No works submitted can be downloaded by the public and used for any other purpose without express permission from WISEArchive. All personal information will be held securely and not submitted for publication. The Archive complies with Data Protection and Freedom of Information legislation. WISEArchive reserves the right to withdraw permission and request removal of any content not used in accordance with our guidelines." here to be directed to this site. Have fun!